This small watercolour was painted during the 1940s, when Cowie was warden of Hospitalfield College of Art, near Arbroath. Although Cowie had painted still-lifes when working as a schoolmaster in Bellshill Academy during the 1930s, it was at Hospitalfield that his still-lifes were at their most metaphysical and compelling. 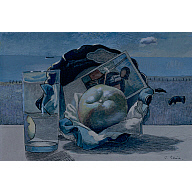 Here Cowie has arranged a group of objects on a window sill, so that he can combine them with the landscape outside - in this case a field and the sea beyond the Angus coastline. 'High Noon' has all the elements of Cowie's most interesting still-lifes: several simple, favoured objects arranged in a highly structured and complicated way; a landscape setting with surreal overtones, the whole viewed as one, yet in some strange way more dreamlike than real. Purchased in 1992 with assistance from the National Fund for Acquisitions.